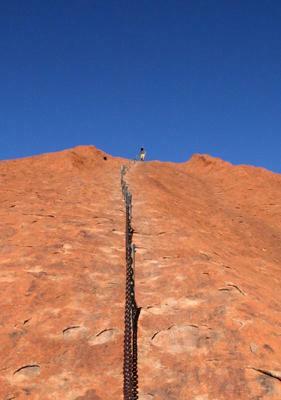 Ever since I translated a story about an illegal climb of Uluru via Ngaltawata in 1976 - I think - for a mountaineering stories anthology, I wanted to climb the rock. Being an enthusiastic and ambitious mountaineer, climbing Uluru appeared a most natural thing to do for me. When I booked one of the Uluru One Day Tours ex Alice Springs, my first priority was to select an agent that offers the climbing option. But I was warned by them beforehand that more often than not the climb would be closed. Well, I had only that one day (05 May 2009) and that one chance. I have a sincere respect for aboriginal culture and traditions and would have had no problems accepting a "no" due to ceremonies that prevented people from climbing, but I reckoned that the weather conditions might be favourable on that day. So when our bus entered the Uluru-Kata/Tjuta NP and I saw that the rock was open (which our guides of the excellent Emu Run Tours grudgingly acknowledged), my heart jumped. I was only worried that our guides would run the schedule in such a way and with so tight timing that the climb might not be possible or closed by the time we arrived at the base. In May days are shorter, but the one day program still follows the year round schedule of things to do. Of utmost importance is the sunset BBQ with bubbly where our guides have the ambition to be the first on site. So, they managed to let 5 aspirants in our group loose at the start of the climb with a mere 1hr 45min to go. I hurried up the chained and steepest part of the trail and then followed the white marks to the summit. I really enjoyed the views downhill, the clean rock with not a single loose stone, the few pools of water, occasional vegetation, strange rock formations,the short friction climbs up and down the waves of rock at the plateau, I enjoyed the views to Kata Tjuta where we had done the Walpa Gorge Walk 2 hours earlier, Mount Connor and the wide country around the rock. As I wished to also do a bit of the base walk, I was back at the start after under 90min (as the climb just was being closed ahead of schedule) and walked the base until I saw Ngaltawata, the beginning of my dream, close up. I am grateful to the traditional owners of Uluru and the land around it that they allow us to climb the mountains as they have done from time immemorial. The chains are great, the marks are clear. The first part is easy but physically tough, fitness and concentration are required, but it is a rewarding trip. Upon reaching the upper part one tends to think the summit is near, but I knew that 2/3 of the climb still lay ahead. Coming down the chain trail is comparatively comfortable, but that is when accidents can easily happen! So take your time and watch you every step. I know in my lifetime I will never understand non-indigenous peoples obsession with climbing every mountain, swimming every river, touching everything around them. Maybe your parents needed to give you discipline as a child. Don't touch or Don't do that. One thing I do know is you really just do not understand who we are and what RESPECT truly means. I feel very sad for you all. It's easy to see why the shocking history happened to us and its easy to understand who you really are. The opening and closing of the climb is a farce and defies logic, as does the "cultural" debate. Each person has a different meaning of respect. Just because we have a different way of showing our respect does not mean we are being disrepectful. Climbing the rock and feeling part of it and exploring all is has to offer brings us closer to nature and to our chosen God. The rock is special for a range of reasons. To me it is a geological wonder created by nature. My God created nature and its processes so ultimately created the Rock. To deny me from worshipping my God in my way is grossly offensive. Just as it would be to stop aborigines worshipping their gods in their way. If you want people to respect nature, then they must be allowed to experience a closeness with it. Denying them that closeness only broadens the distance between our cultures. There are plenty of things the aborigines do in their culture that western cultures find offensive. We are mature enough to respect your culture and allow you to practise it. It is a pity that the respect is not reciprocated. Uluru doesn't belong to all Australians. It belongs to the local Anangu people who are kindly allowing visitors to come see it. Just the same as your backyard belongs to you and you invite a friend to come over, you would expect your friend to be respectful of your space and your property. I don't like how their wishes are ignored anymore than I would like your backyard to be trashed by your friend. If we ruin this place for momentary pleasure the locals may close off the Park altogether, that would be devastating as I want my kids and grandchildren to be able to visit and enjoy this most sacred of sites for many years to come. Uluru doesn't belong to Australians, it belongs to all humanity. That is why it is a world heritage site. I cannot believe how many people still decide to trample all over this rock, which is sacred to the Anangu people. If an indigenous person came into your church, trampled through it and started ripping pages out of the Bible and doing a poo on the altar, what would you say? Because that's exactly the same thing as climbing Uluru. It is SCARY. You may not share the same beliefs, but respect them. DO NOT CLIMB. You say that the Indigenous have been climbing "since time immemorial"... well that's quite an obvious lie. The Indigenous are not allowed to climb it because it’s so sacred, imagine how much of a slap in the face this would be to them if they saw this. The fact that you don't realize this is, is a big of a show of your lack of understanding and respect. Anonymous corrected my assumption made in 2009 that Uluru had been climbed by the locals since time immemorial. I agree that this assumption was wrong. Climbing mountains belongs to many other cultures, e.g. the Incas who climbed mountains higher than 6000 meters in ancient times, or the Chinese or many other people to whom specific mountains are or were sacred: those were climbed specifically because of their sacred status, some were forbidden to climb, e.g. Kailash. The sacred spots at Uluru, I learned, are located around the base of the rock not at the summit. We visitors are not allowed to enter them or take photos of them. The signs instruct us clearly when we must refrain from taking photos. Visitors pay to enter the Sistene Chapel in Rome, Westminster Abbey in London and many other sacred sites. Why not let people pay to climb Uluru? Are Aboriginal people saying they are 'Holier' than other religions who let people see inside their 'religious' temples? what about white people's rights? We talk about aboriginal rights and sacred places and 'respecting wishes for the indigenous people', then the word 'Uluru' pops up ... but, as a white person, what about my rights? Are we as humans not equal? I go to church, but do I 'own the church so absolutely no one except those of my religion can enter?' No. Simple as that. Everyone is equal. No, it is not on if someone came into church and destroyed it - that is just downright wicked, but everyone is welcome, whether they believe or not. In my opinion, same goes for Uluru. I believe everyone should be able to be free to do as they please, but to be respectful to nature and those that believe in Uluru. Easy. Take Gagil Maru's comment for example, "I will never understand non-indigenous peoples obsession with climbing every mountain, swimming every river, touching everything around them. Maybe your parents needed to give you discipline as a child" so, it is not right for us to climb Uluru by their standards, but it is OK for them to destroy and damage white people's building and cars, just because it's not their religion to have them? I think that is twisted logic, to be honest. And then he says "I feel very sad for you all. It's easy to see why the shocking history happened to us and it's easy to understand who you really are." Now what is that supposed to mean? What happened hundreds of years ago is not our problem, don't tell us that we are horrible people because of someone else's decision. I think this person's comments are biased and unfair.